Advertising and marketing is vital for every brand and company which is offering its goods and services to people and in return expecting huge profits on sale. In this cut throat competition scenario people are using the best innovative and creative techniques to bring positive attention of customers towards their brands. Thus, Magic Opener provides you a platform to get maximum positive publicity for your company with highly efficient and aesthetically designed promotional business gifts and products. Undoubtedly, we serve as the premier bottle opening devices and equipment provider but our products can also be useful in providing influential promotion to your business. Generally, presenting gift to someone or exchange of gifts signifies the warm gesture of feeling that one have in his heart for other. However these days, the process of giving gifts is one of the most effective promotional strategies adopted by brands to promote their products and services on larger scale. Magic Opener understands this contemporary corporate gift ideas requirement of brands and thus offers premium quality of products that perfectly blend your brand promotion needs with strategically places brand logos. A gift should be something that can be useful for a person. Thus, we at Magic Opener offer products which a person requires in his everyday routine and hence they serve as best gift ideas for maximum brand promotion to corporate professionals. Our products are perfect for corporate promotion in forms of gifts and presents. Products like bottle opener, can opener, wine opener, beer opener, foil cutter and other household tools and gadgets are almost used everyday by people making it one of the best and inexpensive gift ideas to make their work easy and convenient. Moreover, gifting beer or wine opener along with wine bottle serves as the most aesthetic present for people in corporate world. People generally drink wine or beer and thus they need opener for convenient opening. Hence it serves as best promotional advertising gifts that business people can exchange with their potential business clients or customers to promote and bring visibility to their brand. Whenever they will utilize the opener, your brand will come to their mind with your strategically placed logo and brand name. 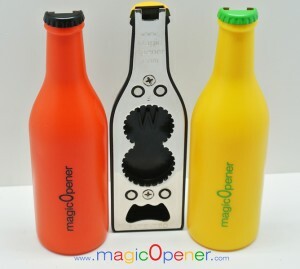 We, at Magic Opener offer high quality of bottle opening devices and other household tools that not only reduce your efforts for efficient working but serve as perfect corporate gift idea for positive promotion of company. Our products are not only mechanically efficient but also designed beautifully to provide a nice look while you use them. Thus they make great option for business people to bring utmost visibility for their brand. So get ready to provide an edge to your business promotion with the most innovative and unique gift ideas of Magic Opener.